If you are not familiar with The Arizona-Sonora Desert Museum, I suspect that to an outsider such a destination might sound like a rather drab way to pass a day. You might feel differently if the name for the "number one tourist destination" in Tucson included the words zoo and botanical garden. 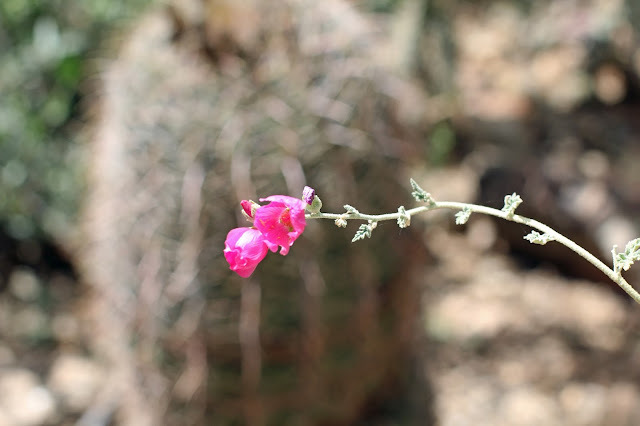 Over the twelve years that I have lived in Tucson, I have visited the Museum approximately twice a year and it is safe to say, that on every visit I have encountered something new. In addition to the 230 animal and bird species that live on the grounds, the Museum continues to add new exhibits, including the recently opened Warden Aquarium. 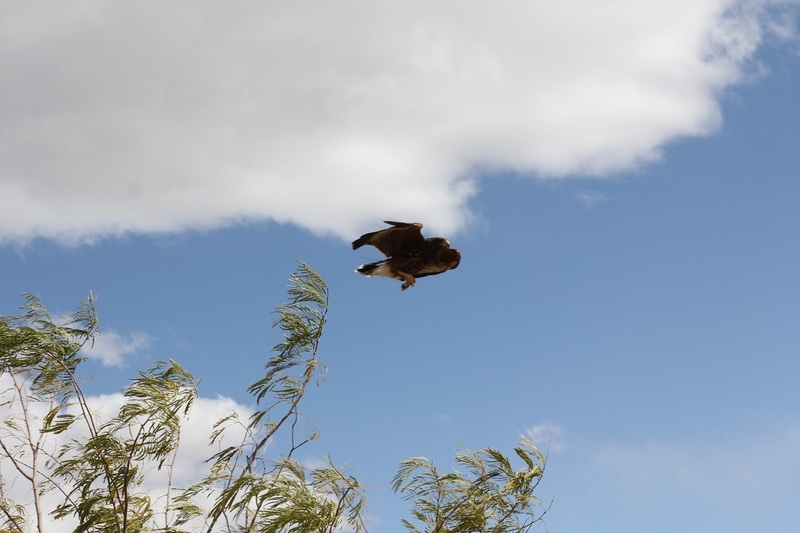 A Harris Hawk is easy to identify by the white on their tails. 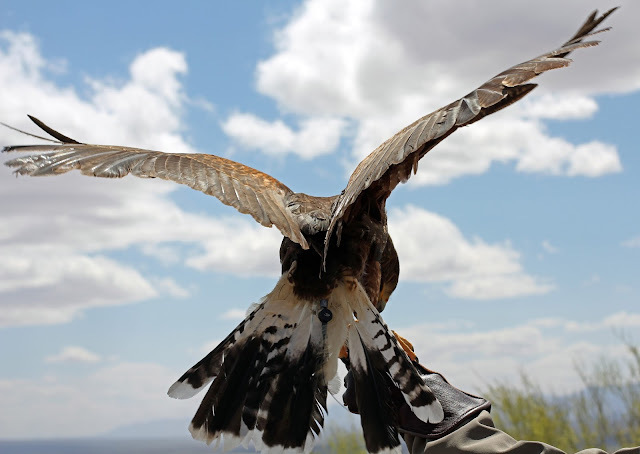 All the raptors fly free and are not tethered in any way. 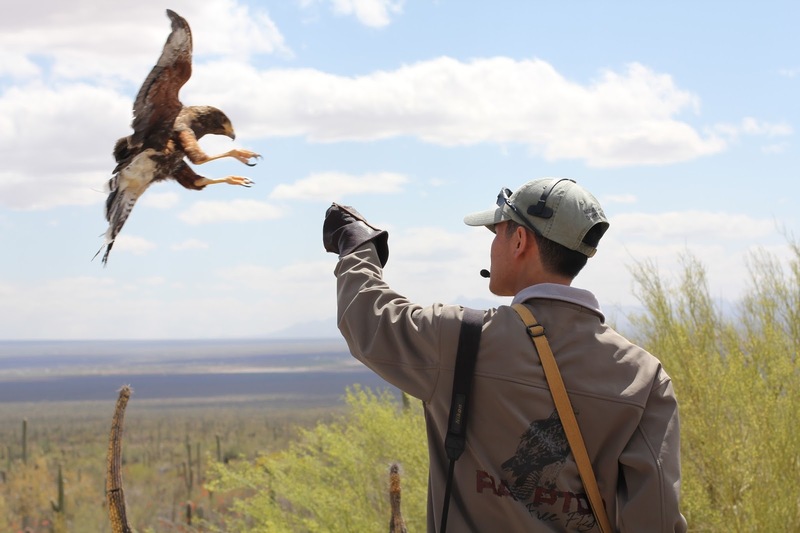 The "Raptor Free Flight Show" is scheduled twice daily from late October through mid April. 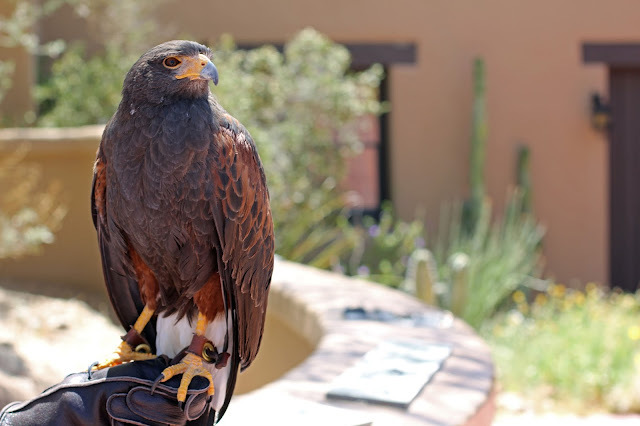 Before you embark upon visiting the Museum, it is worth spending some time in front of your computer reviewing the museum's website to discover what is on the upcoming schedule, including "behind the scenes" opportunities, such as: zookeeper for a day, a private tour of the Warden Aquarium as well as the hummingbird habitat. For the more adventurous, like my sister, Juliette there is a private tour related to reptiles, amphibians, invertebrates (also known as snakes, lizards, frogs, toads, spiders and insects) that live in southwest. These tours are offered by appointment only and require an additional fee. If you happen to be visiting in the summer where the temperature is often in the triple digits, consider visiting the museum on a Saturday, the only day of the week when the museum is open at night. The Cool Summer Nights events run from June through August. 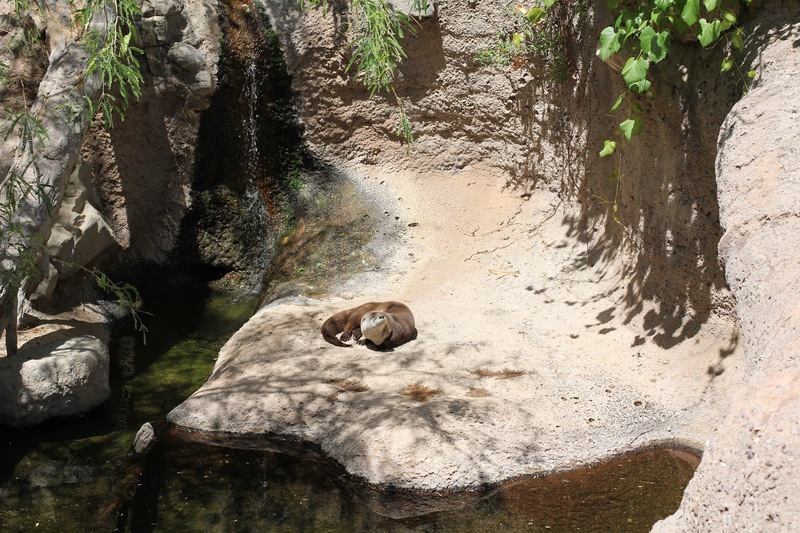 In the heat of the day, many of the animals are not visible, choosing dark secluded places to take a siesta during the hottest part of the day. In addition to the animals being more active after dark, the museum features special events each Saturday night. The themes vary from learning how to capture lightening storms in photography to music programs to astronomy. Check the website for the current schedule. Plan to arrive in time to see the sun sink into the mountains as it sets. I have witnessed the most incredible, intensely colored sunsets while visiting the museum. If you happen to be going at night, or even in the day for that matter, and you have children with you, be sure to discuss a plan on what to do if someone gets lost or left behind. This happened to us one night. Our friends' daughter lingered at the Life On The Rocks exhibit and everyone else moved on. Thankfully, the little girl stayed put and didn't leave. It took about 15 very long minutes to find her. When she saw her dad she began sobbing uncontrollably and could not be consoled with hugs and kisses and kind words. The only fix was ice cream. It's true, ice cream makes everything better. Life On The Rocks exhibit. always seems to feature quirky characters and binoculars. The elusive coati finally needs to quench its thirst. 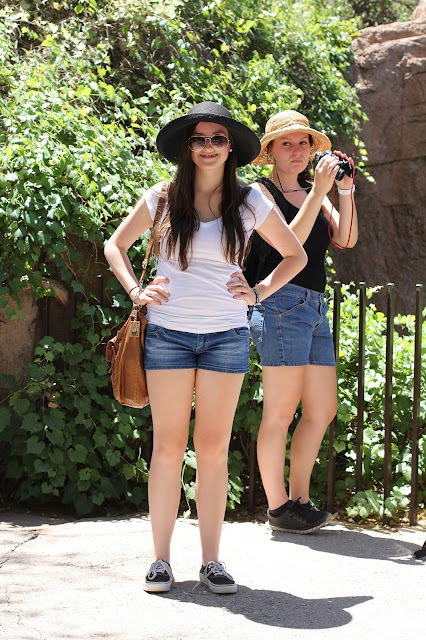 To make the most out of your visit, pay particular attention to your clothing and sun protection. The Museum, on average, has 87 days a year at a temperature of 100°F or higher. I prefer to wear lighter colors, with shirts that cover my shoulders and all items that I choose are made of cotton. Closed toe walking shoes are highly recommended, especially if you are participating in a summer nights program. Be cognizant that not everything that slides and crawls in the night is in a cage. Open toed shoes are fine for Las Vegas but you'll be on a walking path in the desert. Sun screen should be liberally applied to face, body, hands and feet, especially if those feet are wearing flip flops (I know that there will be people that ignore well intended shoe advice). In fact, sunscreen is so important that it is offered for free in most restrooms at the museum. I'm one of those gals that is particular about brands. Also, it is better to get everyone lubed up before you go, if nothing else for convenience, and to make sure that all the bits are covered. Slather it on. Oh, and I almost forgot to recommend that you wear a hat. You can probably tell that I'm not a sun worshiper. Bighorn Sheep as viewed from the upper deck. 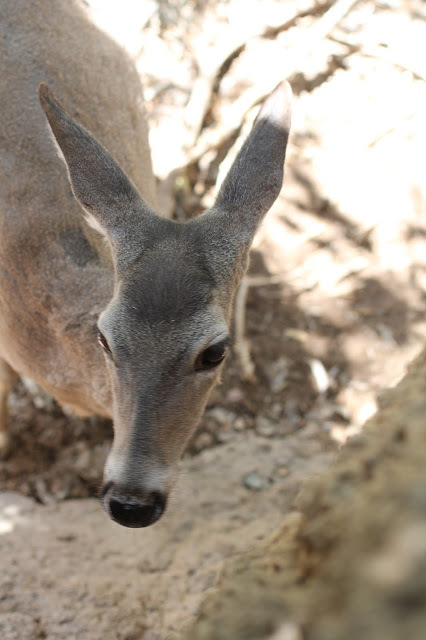 This sweet doe wandered over to me to say hello. they are more closely related to house cats than to lions. 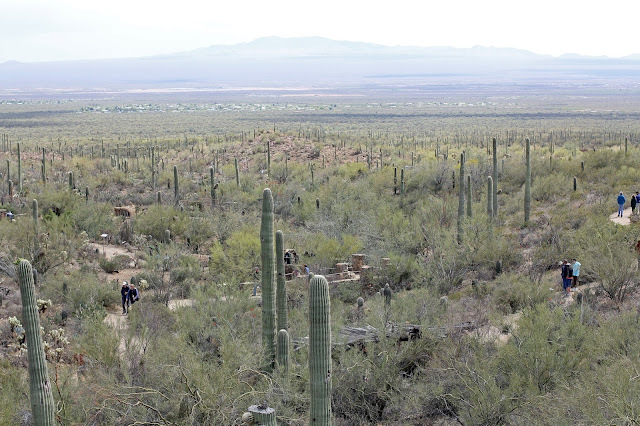 In the hotter months, the unpaved Desert Loop Trail that leads to the Javelina exhibit and the Coyote Ramada, can feel like a hiking trip gone awry. In 2009, a Dutch visitor encountered a wild Javelina on a walkway near the Javelina exhibit, of all things. Whoever thought up the saying, "ain't nothing nice about nature", might have been thinking of Javelinas. The Dutch man put himself between the frightened Javelina and his two even more frightened daughters. Dad protected his girls but the family finished their day at the hospital. 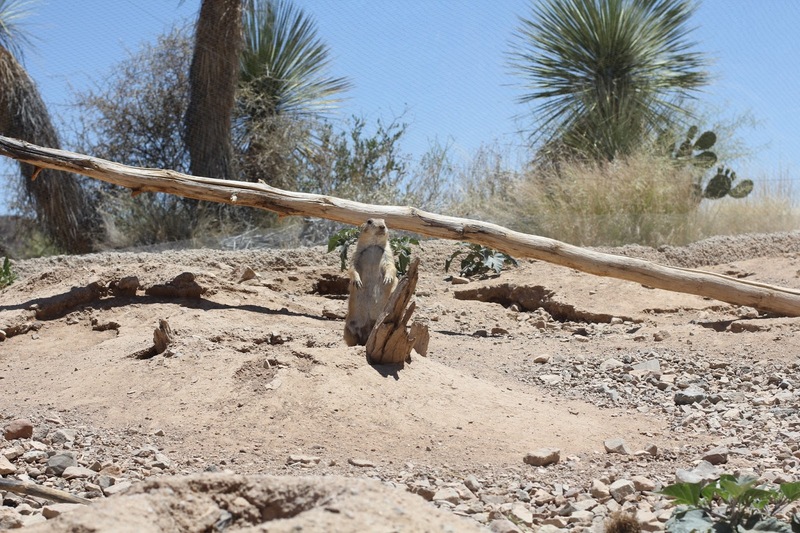 The javelina disappeared in the wilds beyond the museum and was not found. It is not unusual for odiferous Javelina families - ranging in packs from 10 to 50 members - to appear at night in suburban neighborhoods searching for food. What is one person's trash is a Javelina's comeuppance. Last summer there was a Javelina family romping in my neighborhood park, just steps from my house. We hopped in the car and drove to see them, staying safely inside while we got a better look. I always carry a water bottle with me even though there are several drinking fountains and refreshment stands scattered throughout the park. If you have small children that are walking on their own without aid of a stroller to rest tired legs, you might want to all together avoid the Desert Loop Trail. 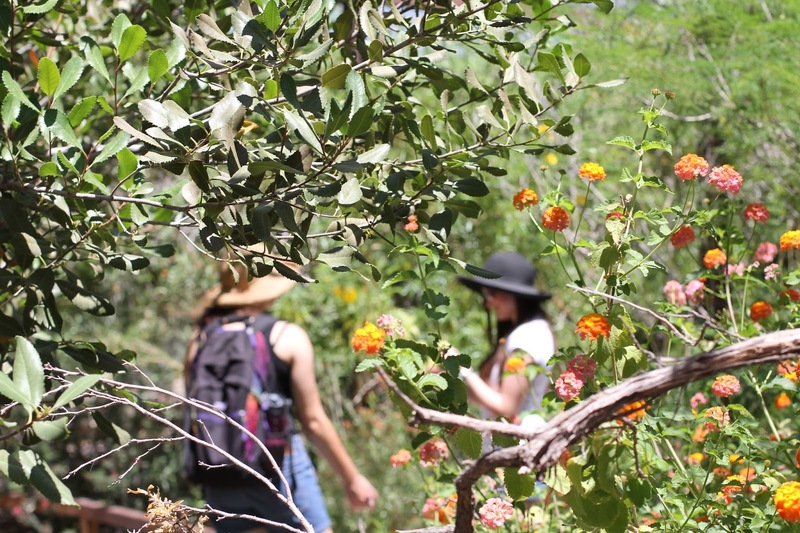 There's plenty of exciting things to do without wandering down that long and meandering dirt trail that offers little relief from the sun, at least in the hotter months. The playful otters can be viewed below ground and above. 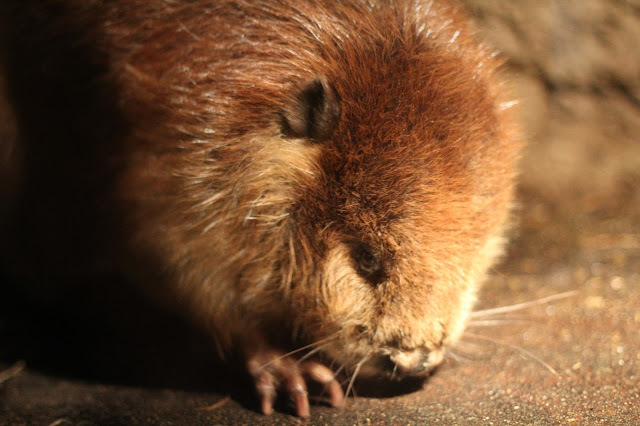 A beaver prepares for an afternoon nap in a cool cavern visible through glass. Now if folks would just stop poking the light. One of the frequently asked questions at the museum relates to whether any of the animals have tried to escape. This following quote extracted from the museum's website speaks volumes about beavers: "There have been a few escapes over the years. Probably the most famous was a "beaver breakout" which took place a number of years ago. 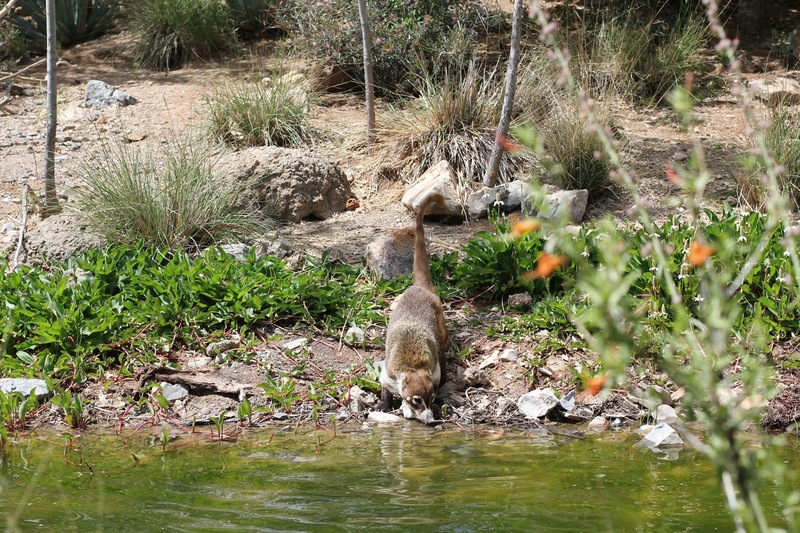 One night, the beavers left their pond, waddled through the bighorn enclosure and escaped into the desert. The next morning Museum people followed their tracks, which headed west and before long stopped near a set of coyote tracks. Swirling beavertail prints in the sand showed how the beavers had made an about-face and headed back to the safety of their pond. They never attempted another escape." I wonder how the coyote(s) fared. I read in the paper not too long ago that a beaver killed an eastern European man in Belarus. Insert your own inappropriate angry beaver joke here. The moral to the story is don't mess with beavers. They can be incited to violence and deadly when provoked. 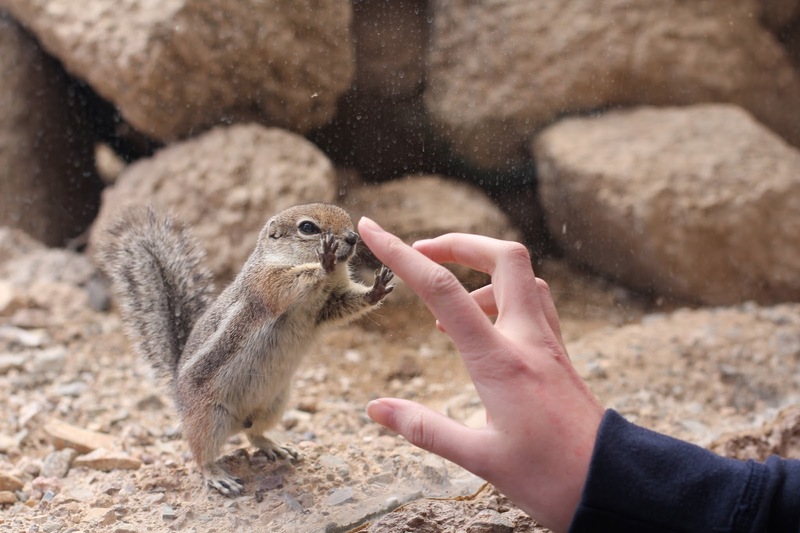 Other than that, they are really cute, especially for being a rodent. King of the hill for a mere few minutes until the matriarch shows herself. The Prairie dogs are overflowing with personality and are entertaining to watch. Two miles of walking paths meander through the park leading visitors to each exhibit. 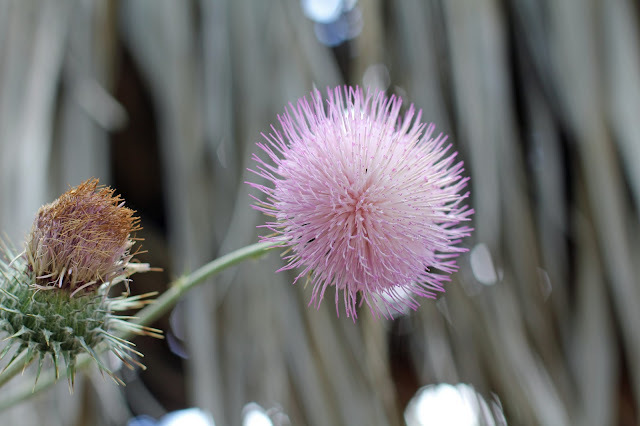 This thistle reminds me of Horton Hears A Who. 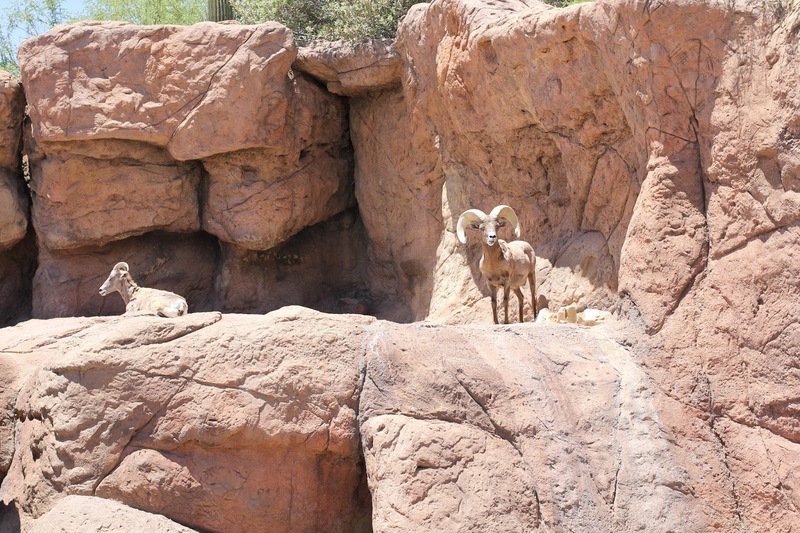 I am decidedly a fan of Desert Museum, but in general I must admit that I'm not particularly fond of zoos. In the late '90s when my daughter was a toddler and we lived in the Bay Area, I decided it would be a fun outing to visit the San Francisco Zoo. The memory that I cannot shake was visiting the polar bear exhibit. I felt overwhelming grief for the polar bear who appeared downtrodden and utterly miserable. To this day, I would swear under oath that he was shedding tears. I don't feel overly connected to animals like my sister Juliette who is the Doctor Doolittle of our family. And yet, that day, I connected with the polar bear in a way that I have not experienced before or after. I am not prone to crying, but my reaction was so intense and so vivid that I was flooded with emotion and I began weeping. When I managed to pull my watery gaze away from the bear I saw that our au pair from Germany was also weeping as was my daughter. We were all transfixed by the bear. As I have written before in the blog, I don't have a great capacity for remembering, but I do clearly recall that sad interaction with a despondent bear who was far, far away from home. If you have a difficult time with zoos, I suspect you will like the Desert Museum, just like I do. 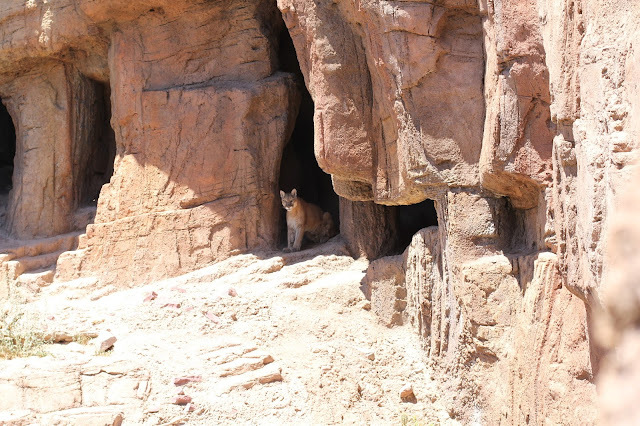 In fact, the Desert Museum, founded in 1952, set precedence for housing animals in enclosures that resemble nature. 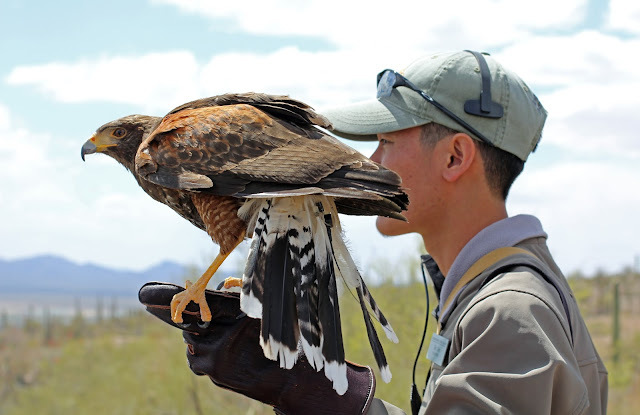 My hope is that for animals that cannot return to the wild, that they can live in a zoo like the Desert Museum and that visitors can learn from the scientific and educational programs so people can better understand and appreciate the Sonoran Desert and its inhabitants. 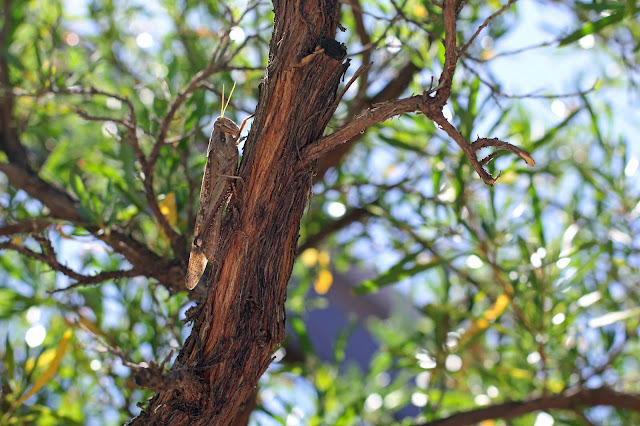 And, commune with nature where humans can cohabitate with predators. A favorite novel that explores the subject of predators is Prodigal Summer by Barbara Kingsolver, a former resident of Tucson. Lantana lends beautiful color to the desert. Not just purple, but yellow, and red, too. leaves appear with the onset of rain. I learned from the museum's website that on average most of the nearly half a million visitors per year only stay between 2 to 3 hours. Huh? There is so much to see and do that it is easy to spend an entire day. 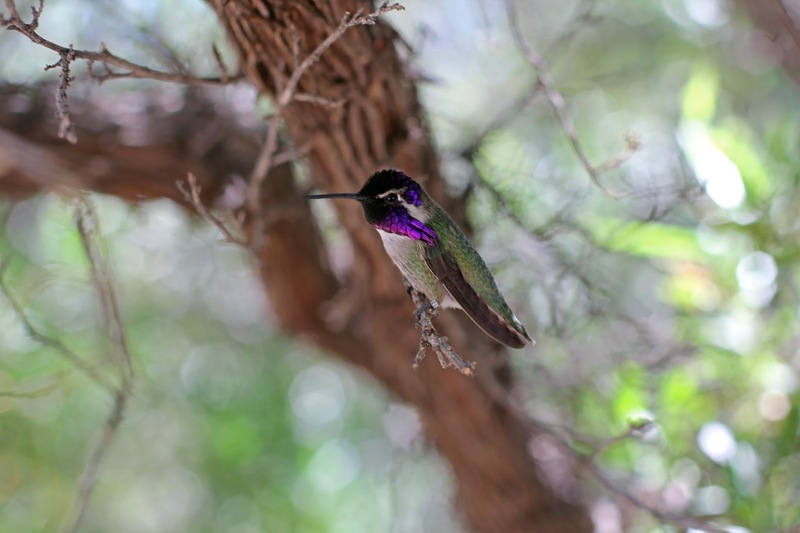 What we typically do is arrive midmorning and proceed directly to the Hummingbird Exhibit. 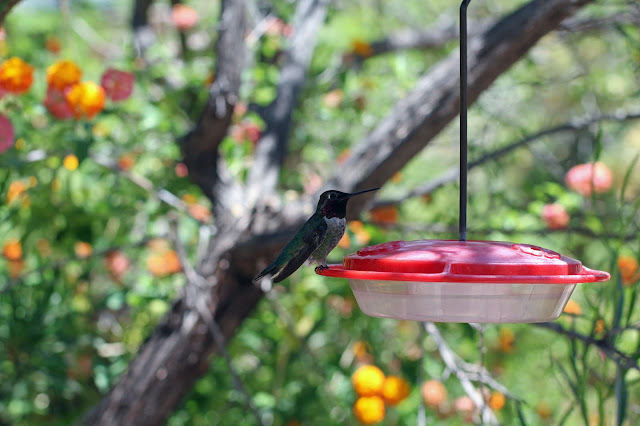 After we say goodbye to the hummers, we head to lunch at the self-serve grill. I usually order the Tostados Grande (I make this version at home) and the kids vacillate between choosing a freshly grilled cheeseburger made to order or a giant slice of hand tossed pizza. The food is actually good and there is nice variety between specialty sandwiches and wraps, Sonoran Cuisine and salads. If the weather is pleasant, you can sit on one of the open or covered patios. There is also a large air conditioned indoor dining room with floor to ceiling windows that capture the beautiful landscaping or the expansive view of the desert and mountains. After lunch you have the rest of the day to leisurely enjoy all the attractions without hearing someone in your crew whine, "I'm hungry." During the summer months, the Ocotillo Café is open for dinner on Saturday nights and reservations are recommended. 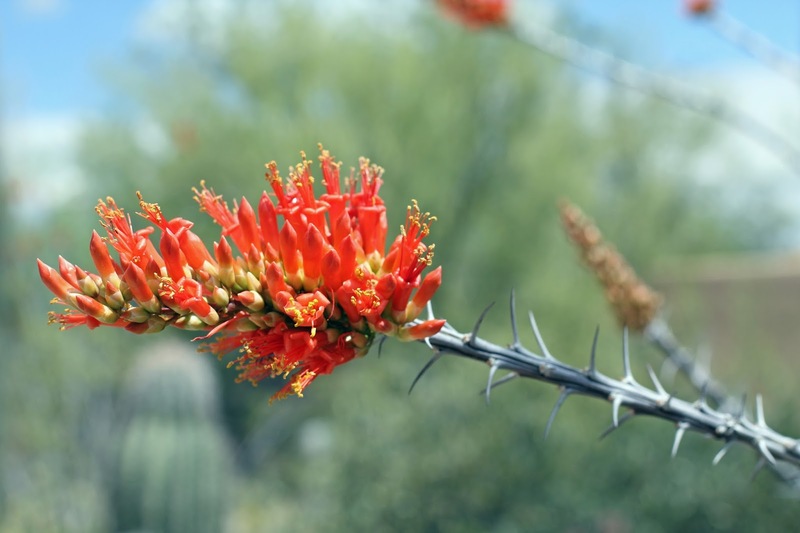 By the way, Ocotillo is pronounced Ock-oh-tea-oh, not Ock-oh-till-oh. It never fails to amuse me when I overhear a tourist "slaying" the word. That's okay. When I was in France butchering the French language, the locals were openly bemused by my failed attempts. What goes around comes around. Back to the fine dining restaurant. The menu is regionally focused. 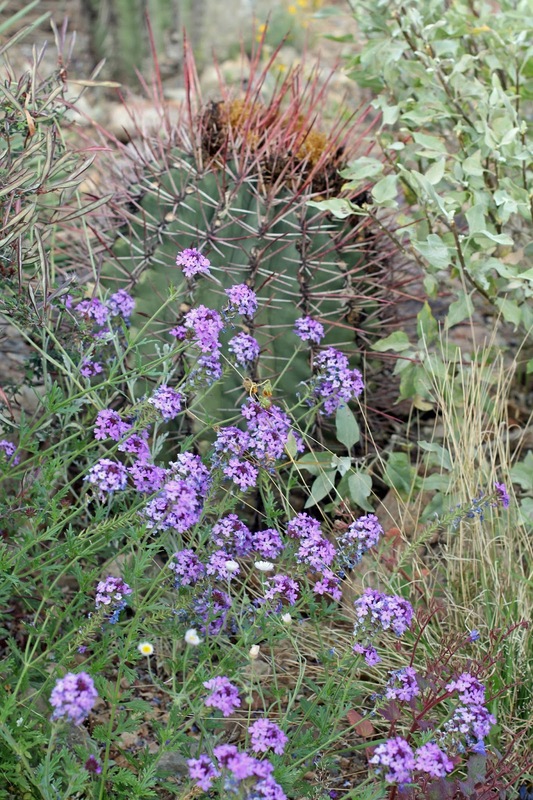 Try the Prickly Pear Margarita or the Prickly Pear flavored iced tea. barbed nodules. Watch where you step. I'm drawn to the whimsical nature of the mallow flower. 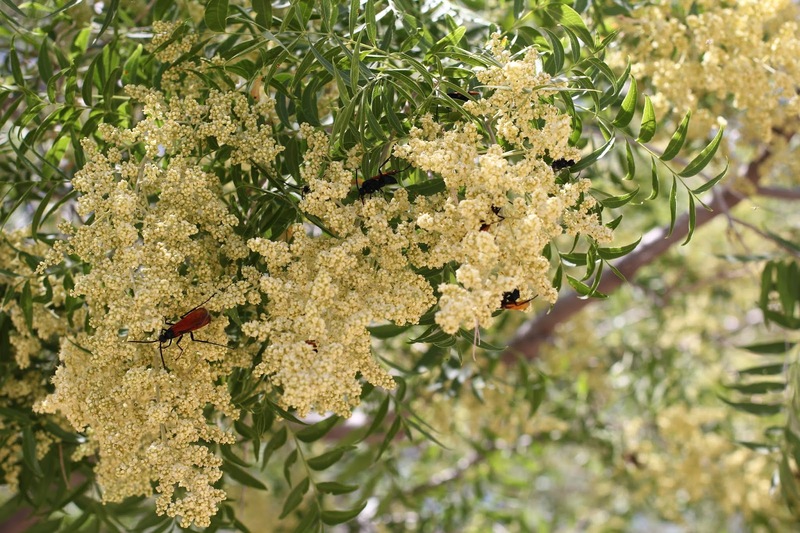 the paddles, flower petals and fruit, referred to as a pear. 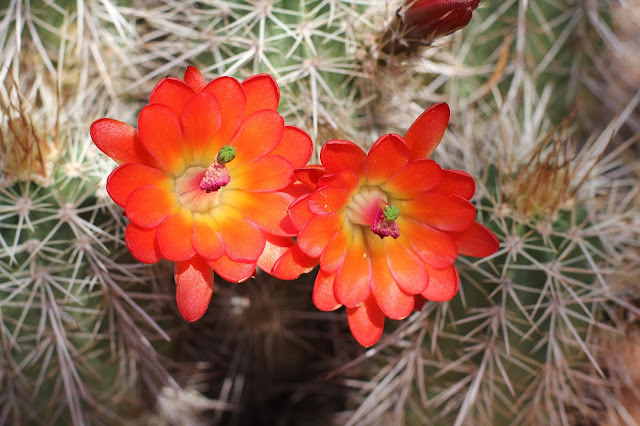 Prickly pear cactus are abundant in the Tucson area and many people get into the spirit of living in the Sonoran Desert by harvesting the fruit in August and preparing jam or syrup or other sweet treats. The juice is used by many restaurants in town to make a specialty margarita. I've always been a little leery to work with the prickly pear fruit due to the protruding needles, but perhaps this year I'll take one of the classes offered at the museum that provides instruction on how to prepare the fruit. 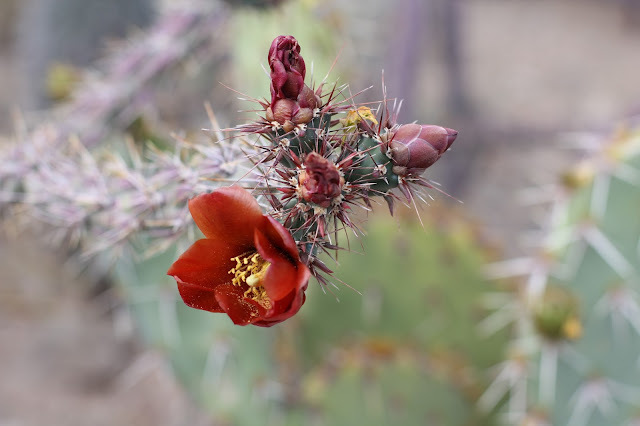 I remember when my daughter was small, she and her best friend Maggie decided during a dinner party that they would take it upon themselves, unbeknownst to me or Maggie's mother, to harvest prickly pear fruit to make jam. Yes, this does fall under the category of "What were they thinking?" Maggie's mom and I were busy putting the finishing touches on dinner when the girls made a dramatic, teary-eyed entrance into the kitchen. Little hands were full of tiny stickers. That night I learned the Elmer's glue trick thanks to Maggie's mom. We flooded the girls' hands with Elmer's glue and waited for it to dry. Once the mass was solid, the girls could peel off the glue thereby removing the stickers. The famished girls were not first to the table that night but they did eventually eat dinner with tender, red, aching hands holding heavy utensils. Maddie sums up the tragic experience in three words: "It was horrible!" When I reminisced with my husband about our daughter's experience, Jay reminded me of a similar story involving his mom and brothers. 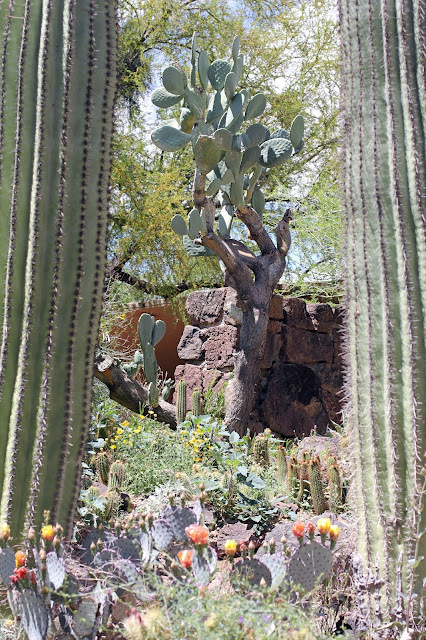 The family moved from Wisconsin to Arizona in the mid 1960s. Joan was an amazing cook and could be quite adventurous in the kitchen in her younger years. 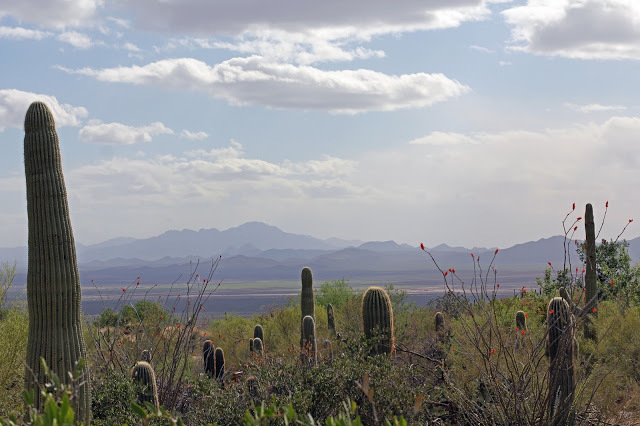 Upon moving to the desert she was inspired to make prickly pear jam, so she loaded up her mischievous sons and boldly drove into the desert on a hot August day to harvest pears. The carefully collected fruit was placed in the back of the station wagon. The car didn't have air conditioning, so the windows were rolled down all the way for the drive home. The wind caught the fine needles on the fruit, and like down on a thistle spread throughout the car and got caught in skin and upholstery. Jay said the needles nearly ruined the interior of the car. The family members felt poking needles for months afterwards which were angrily plucked from skin and fabric and then discarded. the better to catch its prey. I could have reached out and touched him. He gallantly cooperated for the close-up portrait. deal of time watching the birds. In addition to the Hummingbird exhibit, I like to take my time slowly wandering through the walk-in aviary. There are benches to take the load off and I enjoy sitting a spell watching the birds go about their daily business. The birds are fairly tame because they encounter nearly 2,000 visitors a day. On the afternoon that I took the photos of the parrot, it got to the point where I felt like a stalker. Poor bird. He'd fly away and then I'd follow him. He seemed to enjoy the attention some of the time, but that's probably just me projecting my feelings upon him. 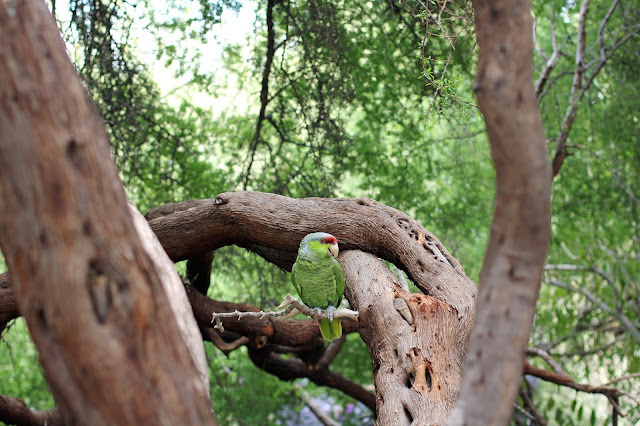 Once upon a time there was a flock of parrots housed in a metal aviary in the Mountain Woodland's area of the museum. I questioned why the cage was empty and was told that the parrots had to be removed because wildlife neophytes (also known as idiots) were poking fingers through the bars of the cage. This situation falls under the category of things that make me say, "Hmmmmm." Sounds like a bad idea to me, but apparently some of those carefree, unsuspecting folks discovered the hard way that a parrot's beak can easily separate a finger from a hand. Repeat after me: for every action there is a reaction. That must have been a gruesome scene. Which leads me to share with you a fun fact that a flock of parrots is also known as a pandemonium. That's what ensued after the finger got bit off. Some people can only learn through experience, whereas smarter folks can heed warnings. Keep your fingers to yourself, especially around animals and birds. Whether wild or domesticated it matters not, unless directed otherwise by an expert. mature trees and a man-made stream. 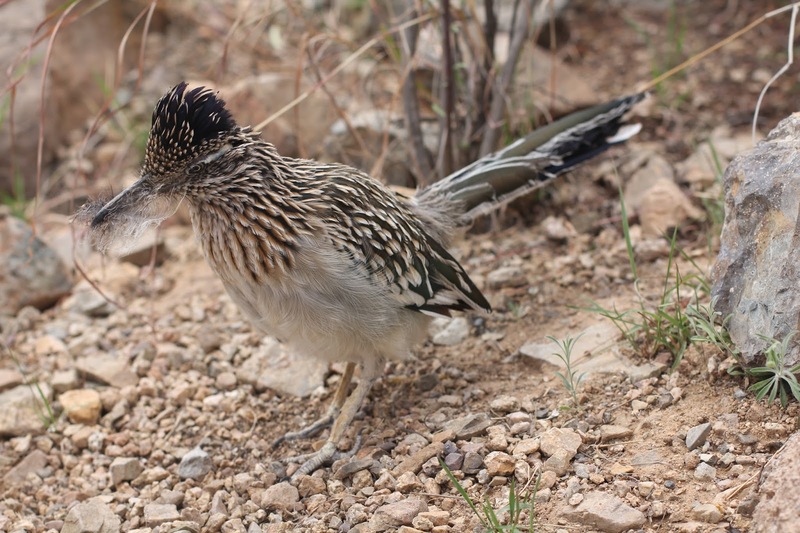 Mrs. Roadrunner fusses over building a nest and uses her beak as a tool to transport the feather. One of the more difficult exhibits for me to adjust to is the reptiles house where visitors can see eye-to-eye with a variety of rattlesnakes, Gila monsters and other vemenous things that go bump in the night. All the reptiles and critters are displayed behind glass but depending upon your comfort level, the tour can still be disconcerting but nonetheless very interesting and educational. The exhibits are done in such a way where the viewer can see just how well the snakes and insects blend into their environments, often rendering them almost invisible. There are exhibits outdoors where lizards live in walled areas and are easy to spot such as the following beautiful - yes beautiful to me - lizard in the photo below. with his portrait. He finally gave in. Yes, you can touch the gopher snake, if you wish. I opted for the side of no. the tree and made a loud humming noise. 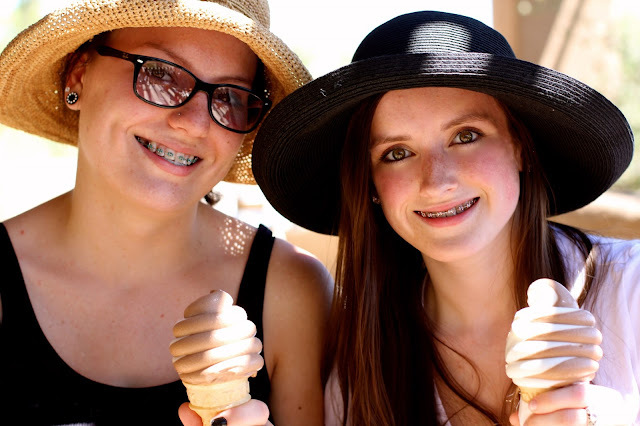 Without fail every trip to the Desert Museum ends happily with a soft serve ice cream cone procured from Phoebe's coffee bar located next to the Mountain House gift store. When we are all hot and tired at the end of the day, soft-serve ice cream is the perfect pick-me-up. It's a tradition and it will stay a tradition. For good reason. Forever and ever. Amen. cones enjoyed while sitting under the covered patio. Inspired by our visits to the Desert Museum, my goal for this post is to make homemade ice cream that is similar to soft serve ice cream. There is a particular mouthfeel to soft serve ice cream that I find appealing. I know I am not alone. Soft serve ice cream also achieves its particular texture because it has a considerable amount of air whipped into it, which is a natural byproduct of making ice cream at home with inexpensive equipment. The key here, which was a revelation to me, is adding nonfat milk powder to the vanilla ice cream. It acts in the same manner as adding cocoa powder to the chocolate ice cream. The consistency changes, but in a good way. Both flavors turned out thick and creamy without compromising the homemade consistency. Because the powder helps to reduce iciness in the ice cream, as does the addition of a small amount of alcohol, the prepared ice cream will easily keep in the freezer for two weeks making it an excellent dessert to make ahead for a dinner party. I had an unsuccessful experience using cornstarch in the past. The cornstarch was supposed to give more of a premium quality to homemade ice cream, but for lack of a better description, the final outcome just seemed gummy. For any recipe that calls for cornstarch, I would swap the same amount with the nonfat milk powder. According to my research powdered espresso will act the same way as cocoa and milk powder. I'm intrigued with trying my hand at making a cappuccino flavored ice cream as it is one of my favorite gelato flavors, but for today we'll stay focused on making really excellent chocolate and vanilla ice creams, which taste great served side by side in a frosty glass. You can make your own swirl. I have adapted these recipes from ice cream experts Ben and Jerry. While the ingredients are nearly the same, I have changed the process from using raw eggs to making cooked custards. You can use raw eggs if you wish. Although I'd probably still go the cooked route for this chocolate ice cream. According to Jerry, it is the combination of cocoa powder and unsweetened chocolate that gives the ice cream an incredible mouthfeel. I think it tastes like gelato, but proper gelato is made without eggs and cream. The first time I made the recipe written as is, the chocolate seized on me and I had a devil of a time getting the chocolate to smooth out. I gave contemplative thought to how to combine the chocolates without having the two turn into a rock solid mass, and I was successful this time around. This recipe is a full-flavored, intense chocolate ice cream. If you prefer a lighter-flavored chocolate ice cream reduce the unsweetened chocolate to 1 ounce, the cocoa powder to 1/4 cup and the granulated sugar to 3/4 cup. Add 1 tablespoon non-fat milk powder to offset the reduction of the cocoa powder. Continue scrolling down the page for the Vanilla Ice Cream recipe. But first, the chocolate. 1. In a large sauce pan, stir together the cocoa powder, sugar and salt. Gradually whisk in heavy cream, whisking constantly until smooth. 2. In a bowl, whisk the eggs until they are light and frothy. Set aside. pour into the Pyrex measuring glass. 3. An easy way to melt unsweetened chocolate is in the microwave. Chop the chocolate and put it in a microwave safe cup, such as a Pyrex. Heat in intervals of 15 seconds, stirring with a table knife between each heating. Stir the chocolate until smooth, then add to the cocoa-cream mixture in the saucepan. Stir to combine. Whisk in the milk, a little at a time, and over medium heat, stirring constantly, heat until hot, but not boiling. 4. Rewhisk the eggs quickly. Take one cup of the chocolate mixture, and slowly add it to the eggs, while whisking vigorously. Add the egg-chocolate mixture to the saucepan. Stir over medium heat until thickened, but not boiling. About 5 minutes. Turn off the heat, and stir in the vanilla extract or bean paste. 5. Pour the mixture through a sieve into a glass container or a clean Cambro. Add the Kahlua and stir. Place the container in an ice water bath to cool. Stir mixture every once in awhile to help speed cooling. Cover and refrigerate overnight. 6. In the morning, freeze following the manufacturer's instructions for your ice cream maker. This ice cream, because of the cocoa powder and small amount of alcohol, should keep well in the freezer for at least two weeks. I actually prefer storing the ice cream in several smaller air tight containers, preferably made of glass with appropriate fitting lids to help reduce the creation of ice. softener salt at Lowe's or Home Depot. I initially wanted to use malt powder, but I learned that malt is made of barley, therefore it has gluten. When I went in search for a replacement for malt, I discovered nonfat milk powder. It was just the ticket, the secret ingredient if you will, for creating mouthfeel similar to soft serve ice cream. I will be experimenting with it further when I make additional flavors of homemade ice cream. I have tried cornstarch in the past which yielded gummy results. So, the moral of the story is, don't use cornstarch, but depending upon your dietary observations, you can use malt powder (gluten) or milk powder (naturally gluten-free) interchangeably in the same measurement. 1. In a large saucepan, stir together the nonfat or skim milk powder and sugar. Gradually whisk in heavy cream, whisking constantly until smooth. 3. Heat the cream mixture, stirring constantly, over medium heat until hot but not boiling. 4. Rewhisk the eggs quickly. Take one cup of the cream mixture, and slowly add it to the eggs, while whisking vigorously. Add the egg mixture to the saucepan while stirring. Whisk over medium heat until thickened, but not boiling. About 5 minutes. Turn off the heat, and stir in the vanilla extract or bean paste. Stir in the milk... this will help cool the mixture. Add the vodka. Stir. always strain the mixture through a sieve. The finished mixture is thick enough to coat a spoon. 5. Pour the mixture through a sieve into a glass container or a clean cambro. Place the container in an ice water bath to cool, if needed. Stir mixture every once in awhile until cool. Cover and refrigerate overnight. 6. In the morning, freeze following the manufacturer's instructions for your ice cream maker. Let the prepared ice cream harden in the freezer for 3 to 4 hours. This ice cream, because of the milk powder and small amount of alcohol, should keep well in the freezer for at least two weeks. I actually prefer storing the ice cream in several smaller air tight containers, preferably made of glass with appropriate fitting lids. Directly from the machine the ice cream is soft and silky with smooth body. to soften for a few minutes on the counter. I'm glad there is more in the freezer and I'm happy to share. Fantastic photography! I especially like the landscape with the cactus and ocotillo in bloom. 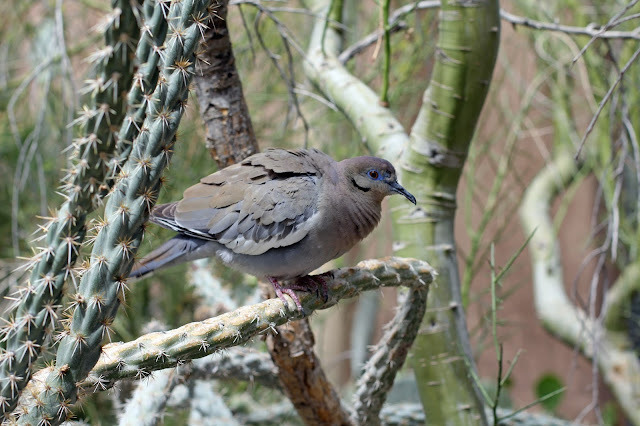 I have lived in Arizona more than 25 years and never been to the desert museum. These pictures are like having been, saves me a trip. Thanks for that.